That would be a pretty cool billboard to see somewhere along the road! Today, is Valentine's Day. If you're single, you're not too thrilled about it and if you're married, men...I hope you did not forget to do something nice for your sweetheart. To show one's appreciation and love should not be only on one single day of the year. Everyday can be Valentine's Day, with the exception of not having to buy roses and chocolates every single day. That would be very expensive and fattening too! I already feel like a jumbo M&M from all the food I've been eating. I need to get away from eating so much pasta. Suggestions anyone? The Bible is filled with passages about love. The word love is mentioned 236 times in the New Testament. The most commonly known verse about love, which Billy Graham, his son Franklin Graham and many others have evangelized to people around the world where Jesus said, "For God so loved the world that He gave His only begotten Son, that whoever believes in Him should not perish but have everlasting life." (John 3:16, NKJV). As I sit here thinking about that verse, I asked myself, why would God love the world so much to send His Son to die for people so that they may gain heaven? How could He love the world when it is filled with so much that is not good? Well, first we have to recognize and acknowledge that God did not create that which is not good. The story of creation, in the book of Genesis, God had said "it was good" after everything He had created during those six days and when He had looked upon all that He had created He said "it was very good." (Genesis 1:1-31). The thing that had corrupted what was good, was the disobedience of Adam and Eve in the Garden of Eden, when they chose to listen to the serpent rather than obey God's command, to not eat from the tree of the knowledge of good and evil. (Genesis 2:17). Despite their disobedience and their fall into temptation, God did not unleash his displeasure upon them. When Adam and Eve had realized they were naked and then heard God walking toward them, God had asked, "Where are you?" (Genesis 3:9). God knew where they were and confronted them about the knowledge of their nakedness and provided clothing for them too (Genesis 3:21). God, our Father, while displeased by Adam and Eve's disobedience, still showed His love toward His most precious creation, despite their sin. He did not condone their sin either. Instead, He cast them out of the Garden of Eden to labor for what they did not have to labor for in the Garden. Since the beginning of time, God's love has not changed. If it did, then God would not be God and He would have emotional ups and downs like us. The Bible tells us in the book of Jeremiah 31:3, "Yes, I have loved you with an everlasting love; therefore with loving-kindness I have drawn you." WOW!!! God's love is continual, eternal and it never ends. His loving-kindness, his motivation that expresses his affection for each person, is His love and that expression of love is found in His Son, Jesus Christ whom was crucified for the sins of the world. 2,000 years ago Christ died for me. Christ died for you. Christ died for the sin that has corrupted every person on the planet. 2,000 years ago He did it out of love. I have never been to Jerusalem, though I hope to go there someday. There, half-way around the world is where God had demonstrated His love toward the world, that while we were still sinners, Christ died for us. (Romans 5:8). So far away from here in New York, but yet He lives within me. I have not seen my nieces or my nephew in quite some time, yet I love them. Though distance separates us, I love them as if they lived right here in my own home. My mother lives in California, my father 45-minutes north from me and my brother, his wife and their children live in North Carolina. All at a distance yet I love them equally regardless of the distance between us. But if I say that I love God and do not even love my brother, I am a liar and the Bible says, "for he who does not love his brother whom he has seen, how can he love God whom he has not seen? 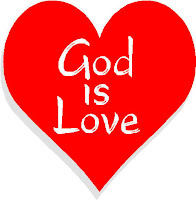 And this commandment we have from Him: that he who loves God must love his brother also." (1 John 4:20-21). Even though the Valentine's Day is almost over, celebrating the love God has shown to each one of us occurs on a daily basis and that needs to be appreciated so much more, myself included. Even more, we should show our love to God. How? Well, Jesus tells us how to do that. We are to first, love the Lord your God with all your heart, with all your soul, and with all your mind. And we are to also, love our neighbor as we love ourselves. (Matthew 22:37-39). And if we do love Him, we will keep His commandments. (John 14:15). Sent to you, with love today and everyday. Whoever confesses that Jesus is the Son of God, God abides in him, and he in God. And we have known and believed the love that God has for us. God is love, and he who abides in love abides in God, and God in him. 1 John 4:15-16. Praise God for His Sacrifice of LOVE!!! Oh well....have a blessed day today Kurt. Preach on brotha, preach on. Thank you for writing a thoughtful piece on what the secular world recognizes as a day of love. But as we all know - the world celebrates the temporal love that comes and goes like the day itself. Even so, I appreciate the day though I am single, because it was Valentine's day when the Lord showed me His love for me. Once I saw His love I was like the beloved in the Song of Solomon ...I was sick with Love.